What are daguerreotypes? The process of producing daguerreotypes was refined by a Frenchman, Louis Jacques Mande Daguerre, using his own experiments and following the footsteps by Joseph Nicephore Niepce. Fall 1839, the mysteries of the daguerreotype were publicly announced in Paris by Dominique Francois Jean Arago, secretary of the French Academy of Science. Everyone who had an opportunity to view the still lifes and architectural views by Daguerre, produced on whole plates that measured 6 1/2 inches by 8 1/2 inches, were amazed by the precise delineation and the marvelous range of tones. Bits of phrases, "buffing the plate; coated with iodine; and developed with vapors of mercury", were heard in the streets of Paris immediately following the revelations. Academics, scientists and common folks were all stunned by this new and daring object. Because the exposure times Daguerre used to produce a latent image were over one hour, he initially felt that making a portrait would be impossible. But leave it to the Americans, who received official notice and instructions via French and English newspapers that arrived aboard the "Great Western", fastest of the transatlantic steamers. She docked in New York at 7 a.m., Sept. 10, 1839. Instantly, crude cameras were manufactured, lenses ground, and chemical experiments were conducted. Before the end of the decade, several men had succeeded in recording the human face on a shimmering silvered surface that was clad to a copper base. The public was astounded by the wizardry of the Alchemists, who were actually the world's first portrait photographers. 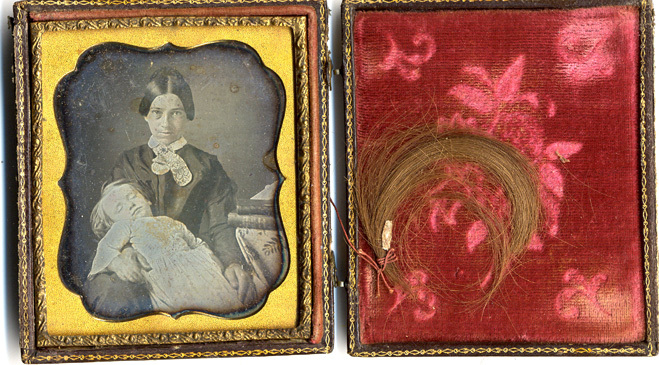 Daguerreotypes were a fashionable rage, available initially to the experimenters and their wealthy acquaintances. Studios began to blossom in several of America's largest cities during 1840 and as more businessmen began to practice the art, competition grew fierce and prices dropped. "Have you been taken or may I see your likeness?" were common questions spoken on avenues in the largest cities and dusty trails in the tiniest hamlets by the end of the 1840's. The commercial and artistic successes of daguerreotypes remained unchallenged until the mid-1850's and finally lost favor about 1860, due to three overwhelming advances in photography. In 1854, the method for making ambrotypes, which are negative images on glass (until a black back was added) allowing the portraits to be viewed as positives, was offered to the public. They had very little reflectance and decent sharpness. Next, in 1856, a pair of men both from Ohio and working independently of each other devised the tintype, which was light sensitive collodion spread on the surface of thin sheets of cheap metal. The third process, which was a precursor for today's negative/positive system of photography, involved coating glass plates with a light sensitive collodion and then making numerous reproductions from one negative on paper. Since daguerreotypes, ambrotypes and tintypes were all direct positives, people and photographers heralded the convenience of this process. 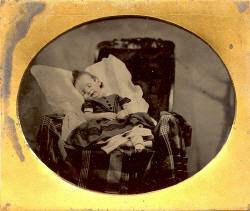 The importance of daguerreotypes in the mid-19th century can not be overstated. Millions of faces and many thousands of scenes were recorded. It was the first time in history that Americans could see themselves "true to life" (albeit laterally reversed because there wasn't a mirror inside the camera to correct the light's rays as they passed through the lens). Many of the black & white daguerreotypes were delicately hand colored and most were uniformly presented to the patron surrounded by a brass mat with a piece of protective glass on top. The small wooden and leather cases or molded thermoplastic varieties were works of art themselves.